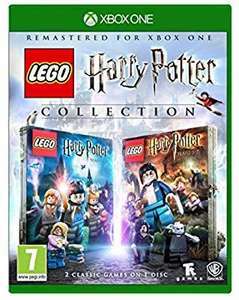 LEGO Harry Potter Collection brings LEGO Harry Potter: Years 1-4 and LEGO Harry Potter: Years 5-7 to Xbox One for the first time with both top-selling videogames remastered on one disc. LEGO Harry Potter: Years 1-4 is based on the first four books and films-Harry Potter and the Philosophers stone, Harry Potter and the Chamber of Secrets, Harry Potter and the Prisoner of Azkaban and Harry Potter and the Goblet of Fire -allowing fans to experience Harry's first four years at Hogwarts School of Witchcraft and Wizardry in full LEGO form. LEGO Harry Potter: Years 5-7 transports players through the final three books and final four films-Harry Potter and the Order of the Phoenix, Harry Potter and the Half-Blood Prince and Harry Potter and the Deathly Hallows-to experience Harry's last years at Hogwarts and his battle against Lord Voldemort in the ultimate fight between good and evil.